8-10 days to your hand Air way + door to door service. 15-30 days to your hand Sea way + door to door service. Production time Samples Usually 7- 15 days after paying. 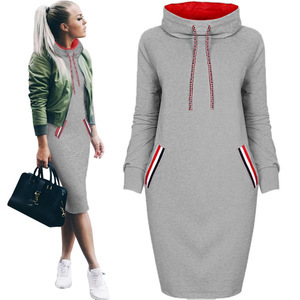 knitted hooded sweater dress ---Material: A marled knit hooded sweater dress featuring a longline silhouette, contrast drawstrings, fleece lining, a kangaroo pocket, and long sleeves. - 80% cotton, 20% polyester - Machine wash cold - Model is 5'7.5" and wearing a Small - Full length: 35" - Chest: 32" - Waist: 32" - Sleeve length: 22" ---Our MOQ: Low moq for the initial order,accept small quantity, we have our designers team, so your sample/ sketch can be manufactured; ---Samples: lead time 5-10 working days; ---Mass productions delivery time: 20-30 days ; ---Payment term: 1) We accept T/T, western Union, Paypal. ---About the label : We can put your neck lable,hand tag,care lable in your orders ---For the size : we can do as your size secification --- Quality control : we have two QC department, for the first time inspect the products including cutting the thread ends, ironing the order , clearing the stains , After, we need to check the size fit whether that is meet customers' size specification Packaging & Shipping Products procedures Offer fast service:sometime maybe I am not on computer so please check the below image to find somemore contact ways about us Thanks for your browsing and have a nice day!!! Factory Display Hall Q: Are you a Manufacturer or a Trading Comapny9 A: We are a profession Manufacturer which have own factory and design team. Q: Can you supply a sample to me9 A: Yes,we can supply a sample to you and the sample fee is refundable when the order confirmed. Q:If we received defective goods,what shall we do9 A:If any dissatisfaction with our goods,please contact us immediatedly. Zhejiang Milalio Fashion Design And Manufacture Co., Ltd. When Quantity is ok, you can mix colors as you wish. Q5. Can you add our own logo on the products9 A : Yes. If you have this need, welcome to contact me! Finally, the price of the order settlement page will prevail. Unlined price: the unlined price may be the activity price that the commodity will take part in the activity. If the merchant describes the price of the line separately, the merchant's statement is the criterion. Dongguan Darling Garment Co., Ltd.
Great for teaming with a simple trainer, it offers a relaxed style. Great for any occasions, daily life, parties, easy to pair with any shoes, high boots. Just tell us your ideas and we will help to carry out your ideas into perfect boxes. guangzhou sinkar garment company must be your best partner !!! we provide different kinds of oem service ,you can use your design ,label or others you want. Product name ZH0209G Womens Casual Hooded Jumper Hoodie T Shirt Blouse Tops Mini Sweater Dress Material blending Size S/M/L/XL/2XL/3XL Color black/navy blue Customized Customers provide design or photo or we create design according to customers' requirements Transportation DHL,TNT,UPS,EMS,FedEX Payment PayPal, Escrow, Western union, Money Gram, T/T and cash payment. 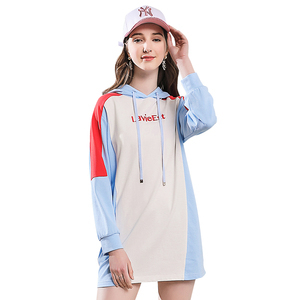 Alibaba.com offers 1,018 hooded sweater dress products. About 20% of these are casual dresses, 12% are plus size dress & skirts, and 10% are women's sweaters. A wide variety of hooded sweater dress options are available to you, such as anti-static, breathable, and anti-wrinkle. You can also choose from corduroy, crepe, and denim. As well as from polyester / cotton, spandex / polyester. And whether hooded sweater dress is in-stock items, oem service, or make-to-order. There are 1,035 hooded sweater dress suppliers, mainly located in Asia. The top supplying countries are China (Mainland), Pakistan, and Bangladesh, which supply 87%, 10%, and 1% of hooded sweater dress respectively. Hooded sweater dress products are most popular in North America, Western Europe, and Central America. You can ensure product safety by selecting from certified suppliers, including 10 with Other, 7 with ISO9001, and 6 with BSCI certification.